Keeping your pet healthy is a life–long commitment. After all, your pet is family. Look after your pet and they’ll look after you. Your pet is family, and family deserves the best. Follow these handy tips to keep your pet healthy and happy. Revolution is as easy as 1,2,3 to apply! See just how easy it is by watching this short video. Have your cat examined regularly from an early age by your veterinarian, and avoid the possibility of worm infection with a preventative treatment. Once your kitten’s regular veterinary visits are complete, make sure to continue with annual check-ups – it can be easy to forget. Indoor AND outdoor cats need year-round parasite protection. Scratching helps shed the sheaths of your cat’s claws, stretches muscles, marks territory, and feels good, so be sure to provide appropriate scratching structures. Just as with people, diet and exercise play a significant role in your cat’s health. Regular activity will help to manage weight, increase cardiovascular blood flow and maintain good health. And contrary to years of bad press, most cats do actually like to play. You might just have to be a little creative until you find exactly what kind of activities your cat likes to do. Make sure your cat has a properly fitted collar and name tag, even if it’s an indoor cat. Accidents happen and if a door is not shut properly, curiosity can prevail and your puss might wander beyond the point of no return. Not only will you reduce hairballs, you’ll have the opportunity to examine your cat’s skin for early symptoms of disease, and for parasites such as fleas, before they become a serious problem. To keep the litter box free of odour and bacteria, empty and replace the litter regularly. Always keep fresh drinking water available in a clean bowl. Water is an essential ingredient for good health and is involved in virtually every function of your cat’s body. Puppies are as vulnerable as they are adorable. Their immature immune systems can’t fight off disease, and the protection received naturally through their mother’s milk can interfere with early vaccinations. That’s why these youngsters need vaccinations several times during the first months of their lives. Puppies also need examination and treatments for parasites, and they need to be started on a heartworm prevention program. Unless you have breeding plans, it is also recommended that your pet be spayed or neutered. A nutritional needs analysis and behaviour counseling round out the care at this important lifestage. Adult dogs should have regular (i.e. annual) examinations and vaccinations with their vet. Take advantage of these exams to fill the vet in on the kind of lifestyle your dog is leading. Because the more your vet knows about your dog, the easier it is for the vet to advise you on your canine buddy’s health needs. And don’t forget to ask your vet about heartworm in dogs, flea treatments, and the other parasites Revolution for Dogs is formulated to prevent. They may not be puppies any more, but adult dogs still need lots of regular exercise. Try to find time to go for a decent walk together once a day. It’ll be good for your dog and good for you too. Once your furry best friend becomes a senior dogizen (around 7 or 8 years old), he or she needs to visit the vet clinic more frequently than before. Ask your vet about senior pet examinations and expanded screenings, disease prevention programs, nutrition analysis and behaviour counselling geared specifically for your dog’s rich golden years. 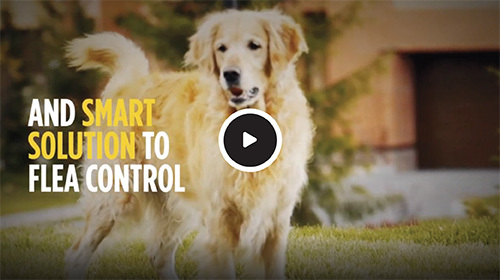 In the meantime, be on the lookout for any changes in behaviour as your dog gets older. While some changes are inevitable and natural, others may be a problem, but treatable. updates for you and your pup. Your pet is family and family deserves the best.